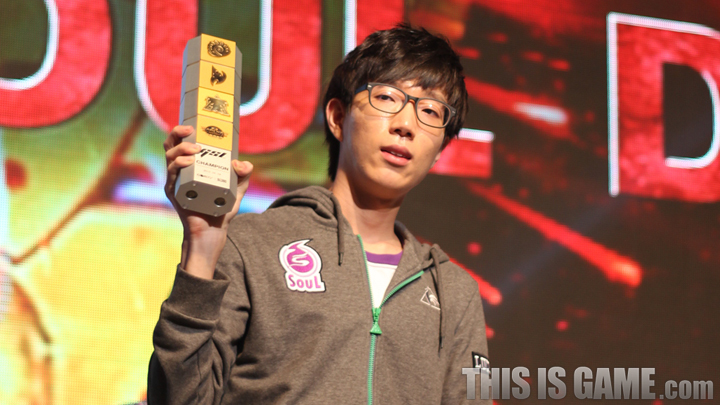 [Interview] WCS Korea GSL S3 Champion! Dear - "I was confident, I knew I would win"
After today's victory, I will be able to work even harder in the future"
Dear, beating soO, was able to record his first victory in an individual league. You've become a champion for the first time in your life. This must be a brand new experience for you. Even before I got to the finals, I was confident and I knew I would win. Maybe because of that I feel like I'm less happy than I should be, but I still feel really good. Because the season finals are still coming, I'm still a little all over the place. 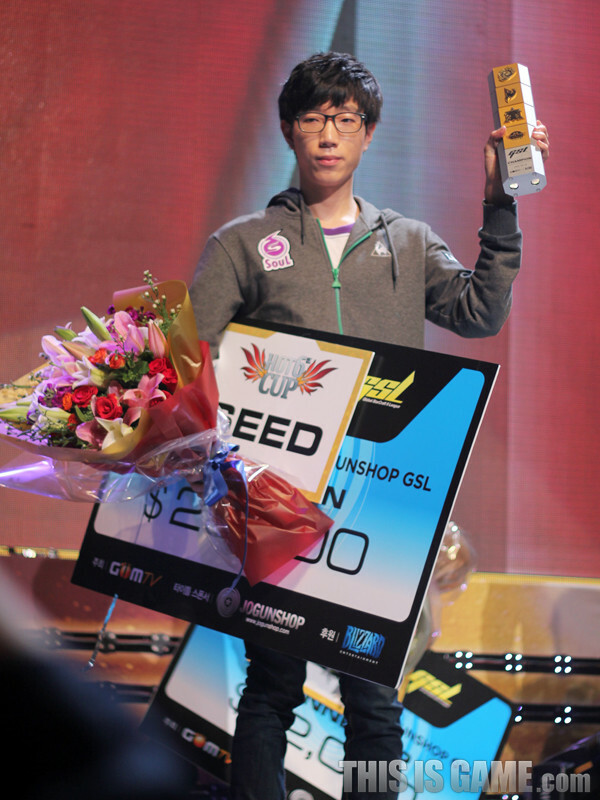 Not only did you become a champion for the first time, but you also became a GSL royal roader. Because it was my first finals and a chance at walking the royal road, there was a lot of pressure on my shoulders. I wanted to have it all. Because of that, I practiced harder for this than any match before. I think because of that, I was able to get a good result. Over your career, you've had a lot of different teams. I felt like I was progressing each time I moved between teams. After leaving from Hwaseung, I started playing broadcasted matches and after I started at STX I became a regular in the rotation. Although it's not certain at SouL, I feel like I've grown a lot. It's not a good thing to be moving teams, but I feel like it's been a great help to me. I think that a lot of analysts think that I'm strong in the early and mid-games, but weak in the late-game. However, in contrast I'm confident in my mechanics and I like going to the late-game. I just had a lot of confidence in my ability to end things in the early or mid-game, which is why I had used the builds that I did throughout the tournament. I feel a little regretful about the analysis of the commentators. At the media-day, you mentioned that you were doing the dishes even the day before the match. Woongjin's sOs came to the finals today. As long as it's not a match with Woongjin, I get a lot of help from sOs. Every match, he helps me as if it were his own. In the 3rd map, you suffered a comeback from soO despite being ahead. During the first map, I felt really uncertain. I did lose the 3rd map, but I thought of it as having switched places in a way with the 3rd map, and didn't get too disheartened by it. You have 2250 WCS Points so far. You still haven't secured a spot in the global finals. I'm planning to take the prize money and treat my team-mates and those I know, take a little for pocket money and then give the rest to my parents. If I hadn't won today, my situation would be much more insecure. I am planning to practice non-stop until the season finals. I think that I will get good results at the season finals. This year, there were no repeat finalists. I think that the most important thing for a gamer is strength of will. I think after this victory, I've gotten a bit stronger. I did win today, but I don't think that I'm incredibly good. I still have a lot of weaknesses. In order for people to acknowledge that I'm a true champion, I think that I have to keep working hard. Because of today, I can work even harder than normal. I think it will be amazing if I can win at the season finals that are almost upon us. Because the season finals draws the best 16 players from across the 3 regions, a lot of the matches are decided by who's in better condition. I will work as hard as possible. Is there anything you'd like to add to finish off? A lot of people came out to the finals. I want to tell them that I'm really thankful. A lot of people worked really hard to help me practice. I want to thank Azubu_Symbol, EG_Revival, Woongjin_Soulkey, Axiom_Impact, FXO_Leenock, JinAir_Coca, JinAir_Savage and from my team SouL Hyvaa, SSanaEE and YoungJoo. I want to thank sOs for helping me as if it were his own finals, even though he's not even on my team. I want to really thank Head Coach Kim Min Ki and Coach Park Jae Seok for coming out to the finals. Because of my victory today, I want to spend today with a happy heart and work hard towards doing well at the season finals. I especially want to thank the coaches again, Kim Min Ki, Park Jae Seok and Choi Yeon Seok for creating this position for a pro-gamer. Congrats to Dear! Thanks for translating the interview! Look at that list of people helping him practice! Other than Jaedong he pretty much had all of the best Zergs in the world to help him practice. So many emotions on his face, amazing ! He's likely to be the only Protoss champion besides MC who seems very consistent. 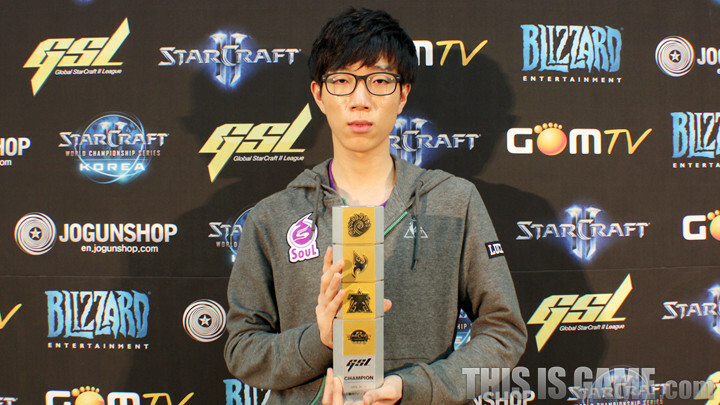 Also, Royal Roader and 3rd ever Protoss Champion in the GSL (1st in HotS). He certainly deserves all these titles and praise. So happy for Dear as well as for team Soul! Generic interview imho. I was watching the games tho. "I want to thank Azubu_Symbol, EG_Revival, Woongjin_Soulkey, Axiom_Impact, FXO_Leenock, JinAir_Coca, JinAir_Savage and from my team SouL Hyvaa, SSanaEE and YoungJoo. I want to thank sOs"
Wow, quite the list, but surprised he didn't mention Trap. And f*** yeah I knew Dear would win! Legend of the fall continues. Grats, Dear! Probably like those kind of things that award receiver thanked everyone but forgot his own wife.